Happy Monday! I hope you all had a great weekend! Mine was great but not so relaxing... at least not Friday or Saturday. On Friday afternoon, I volunteered with PTO at my daughter school's annual Spring Fling fundraiser event. Saturday, we went with a group from my work (I work at an afterschool enrichment program as a STEM teacher) to the zoo to camp out! We met some of the zoo's animals, roasted hot dogs, went on a night hike, make s'mores and then a crazy thunderstorm hit! Thankfully, we made it to our tent just in time but I did not sleep good at all! A mix of rain, thunder, lightning, voices, and bull frogs made for a pretty restless night. But my own kids actually slept through the night so I'll call this camping trip a win because we made so many fun memories together! Today, I'm excited to introduce you to a Aventura, an eco-friendly clothing company that produces sustainable style. Aventura sent me their Carrick Dress that is made out of organic and sustainable fibers. A swing dress is my favorite type of dress and this one doesn't disappoint! 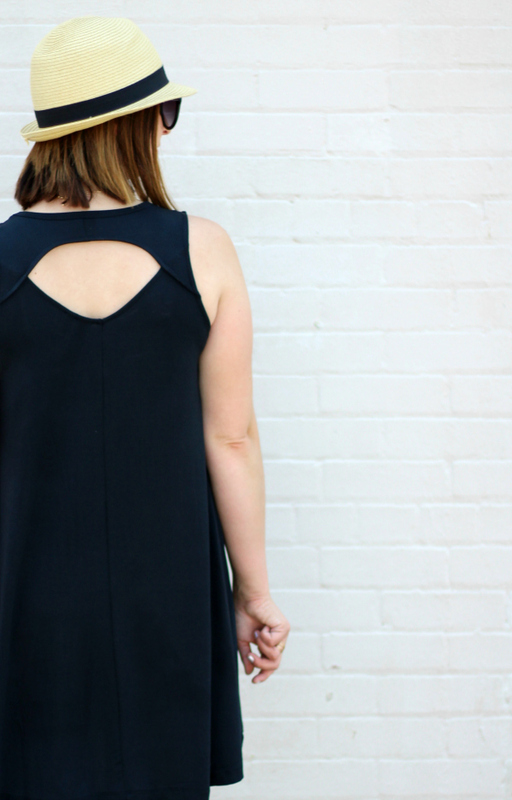 The fun cut-out detail on the back and the soft fabric make this the perfect little black swing dress for spring and summer. Throw it on your swim suit for the perfect beach to lunch look or wear it was a statement necklace and heels for a night out. Such a versatile piece that every closet needs! This dress is so cute and perfect for the upcoming summer weather! How cute are those slides?! LOVE! Sounds like a fun weekend! I love the dress!